Historians aren't completely certain how the character "Uncle Sam" was created, or who (if anyone) he was named after. 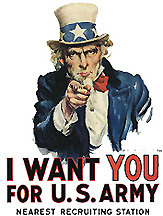 The prevailing theory is that Uncle Sam was named after Samuel Wilson. Wilson was born in Arlington, Mass., on September 13, 1766. His childhood home was in Mason, New Hampshire. In 1789, he and his brother Ebenezer walked to Troy, New York. Uncle Sam's traditional appearance, with a white goatee and star-spangled suit, is an invention of artists and political cartoonists; Samuel Wilson did not look like the modern image of Uncle Sam. For example, Wilson was clean-shaven, while Uncle Sam is usually portrayed with a goatee. Thomas Nast, a prominent 19th-century political cartoonist, produced many of the earliest cartoons of Uncle Sam. However, historians and collectors take note: Many of Nast's cartoons may appear to depict Uncle Sam, while in fact they depict Yankee Doodle or "Brother Jonathan." It is easy to mistake a Brother Jonathan cartoon for one of Uncle Sam, since both figures wear star-spangled suits of red, white and blue. As a rule, Brother Jonathan was drawn with a feather in his cap, while Uncle Sam was not; and Uncle Sam is nearly always drawn with a beard, while Brother Jonathan was clean-shaven. Some have suggested that Dan Rice, a 19th-century clown, inspired Thomas Nast's Uncle Sam cartoons. Rice's clown costume consisted of a hat and star-spangled suit, much like the costome worn by Uncle Sam. However, Rice was born in 1823, and did not begin clowning until 1844; and Uncle Sam cartoons appeared as early as 1838. Therefore, it seems unlikely that Rice was, in fact, the inspiration for Nast's cartoons. 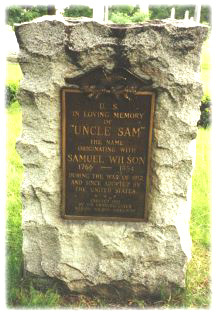 Samuel Wilson is buried in the Oakwood Cemetery, in the Northern part of Troy, New York. From his original inception as merely a phrase used amongst the troops of 1812, to a character with actions and personality, and then to an icon recognizable around the world, Uncle Sam has fulfilled many roles in the construction of American symbology. He has been an icon with which Americans could identify, and by which others identified us. On another level, Uncle Sam has helped to define the relationship between the American people and their government. While Uncle Sam is globally associated with the nation as a whole, for many Americans Sam is a symbol specifically of the federal government. He is comparable to a kinder, gentler, Big Brother. Yet despite this strong relationship in popular culture between Uncle Sam and the government, he was not officially adopted until 1950. It was then that the State Department finally recognized the need for a standardized image of Uncle Sam, not only for Americans -- who had a pretty good idea what he looked like and stood for already -- but especially for the rest of the world, which had been producing its own, often uncomplimentary, versions. Like many other American symbols, Uncle Sam was not produced by the government, or some propaganda office, and then filtered down to the masses. Rather Sam, like Yankee Doodle and Brother Jonathan, originated in popular culture and, after a hundred and thirty-seven years of almost Darwinian evolution amongst the masses, was only officially adopted when it had already become a national image. The creation of symbols such as the Seal of the United States, while produced officially, also reflect the same kind of evolution. The final version of the seal was not adopted until 1884, one hundred and ten years after Jefferson first began to consider its design. The eagle, one of the symbols which make up the seal, was one of the many compromises that went into the final version. The same can be said of the starred helmet of Lady Freedom, who was placed atop the Capitol Building in 1863. Her original headgear had been a liberty cap which was discarded due to its association with antislavery sentiments. The popularity of Uncle Sam as a national symbol after 1812 can be seen as America's first step toward a sense of identity other than regional. Previous symbols, such as Yankee Doodle and Brother Jonathan originated and referred specifically to New Englanders. While foreigners associated these figures with the nation as a whole, internally they were linked to the North and represented that region alone. To many residents of the South, Yankee Doodle and Brother Jonathan were completely alien images. Uncle Sam, although closely related to both figures in appearance -- especially Brother Jonathan -- did not become specifically allied to the North until the Civil War. Sam's increasing resemblance to Abraham Lincoln and Northern values made him an outcast in the South. After the war, however, Sam began to regain his popularity across the nation. By 1917 Uncle Sam was a national icon -- immediately recognizable across the globe. While a large part of Uncle Sam's popularity lies with his lack of definitive link to a specific region, there were two other main factors. The first of these was Sam's role as an unofficial uncle. Unlike many figures representing national governments, Sam was not a monarch or any other kind of ruler. He protected and maintained, but he did not rule or punish. Uncle Sam was not a father or authority figure. This was a very important distinction to the American populous. While the figures of Yankee Doodle and Brother Jonathan were also non-authoritative, they had also cast and bestowed by outsiders -- specifically Native Americans and Europeans. These symbols did not carry the weight necessary for a young nation trying to make its way in the global community. Uncle Sam was the first national symbol which originated from within and, while European influences such as the British Punch did attempt their own portrayals of his figure, Uncle Sam remained an American product. Today Uncle Sam has entrenched himself in American symbology. His image is permanently intertwined with the concept of the nation that the American public holds in its mass consciousness -- an image which also rests in the minds of every want-to-be citizen not yet or just recently arrived. Perhaps even more important than the part Sam plays in our own self-identification, is his crucial role in the way the rest of the world relates to us. For all intents and purposes, Uncle Sam is here to stay.